The Salgo Trust for Education is a not-for-profit foundation established in 1991 and dedicated to preserving and placing the collections of its founder Nicolas M. Salgo through research, exhibitions and donations. In 1959 Nicolas Salgo founded the Salgo-Noren Foundation and established the Salgo Award for teaching excellence as a stimulus and recognition for dedicated and inspirational classroom teachers in the United States. 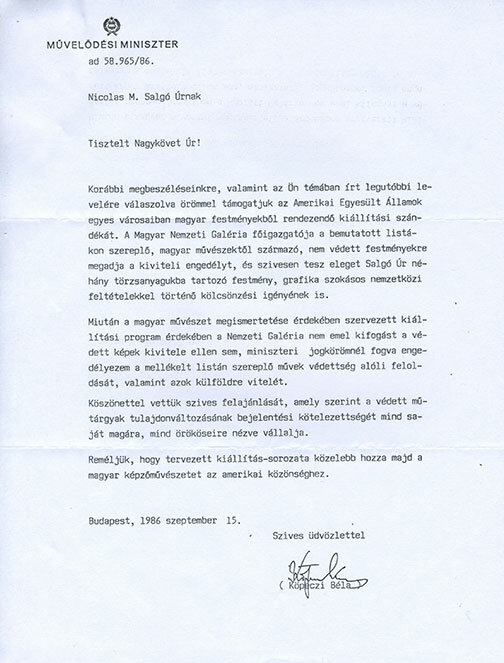 In 1982 he established a Chair in American Studies (now School of English and American Studies) at Eötvös Loránd University in Budapest to support the teaching of American History and lectures by visiting American professors. This was the first program of its kind to be implemented in a Soviet Bloc nation, and continues to the present day. Nicolas Salgo had long been an avid collector, with interests ranging from Hungarian art, maps, sculpture and silver to Chinese decorative art and furniture; from saddles, saddle rugs and horse covers to French furniture; from European game boards, boxes and draughtsmen to shagreen; from Melanesian art to silver marrow scoops and spoons. The Salgo Trust for Education was formed in 1991 with a mission to promote the collections and collecting philosophies of its founder through research and exhibitions. Works from The Salgo Trust for Education have been exhibited in numerous museums both in the United States and abroad including The Metropolitan Museum of Art, New York; The Jewish Museum, New York; the Jane Voorhees Zimmerli Art Museum at Rutgers, The State University of New Jersey; the Art Gallery of the Graduate Center, The City University of New York; the Hungarian National Gallery, Budapest; the Jeu de Paume, Paris; Institut Valencia d’Art Moderne – Centre Julio González, Valencia; Museum für Völkerkunde, Leipzig; the Museum of the American-Hungarian Foundation, New Brunswick, NJ; the Bayerisches Nationalmuseum, Munich; and many others. 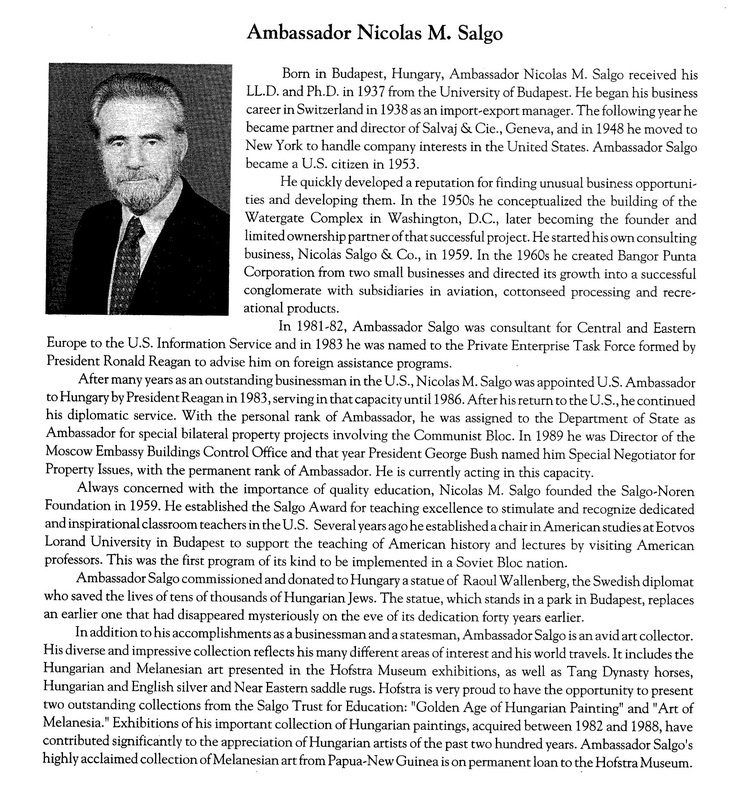 Ambassador Nicolas M. Salgo was born in Budapest, Hungary in 1914 and received his LL.D and Ph.D in 1937 from Eötvös Loránd University, Budapest. He worked for Manfred Weiss Co. in Budapest from 1933 to 1938, when he was transferred to the Corporation’s Geneva offices, where he remained until 1939. Later he moved to the United States to represent the company interests of the Geneva based Salvaj & Cie. of which he was a partner and director. Ambassador Salgo became a United States citizen in 1953. He had already developed a reputation for finding and developing unusual business opportunities. By the 1960s, he had developed a successful conglomerate with subsidiaries in aviation, cottonseed processing and recreational products. 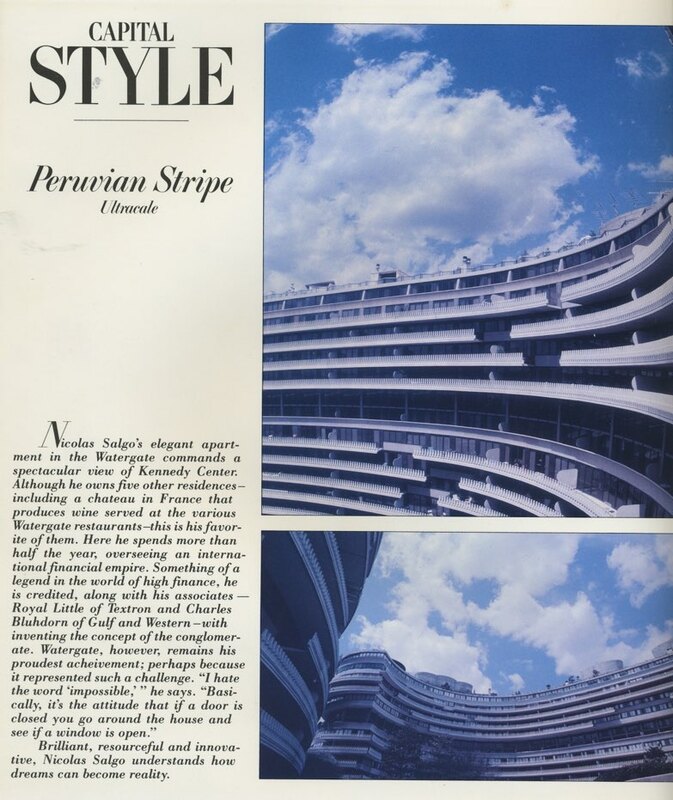 He conceptualized the building of the Watergate Complex in Washington, D.C., becoming founder and limited ownership partner of that successful project. 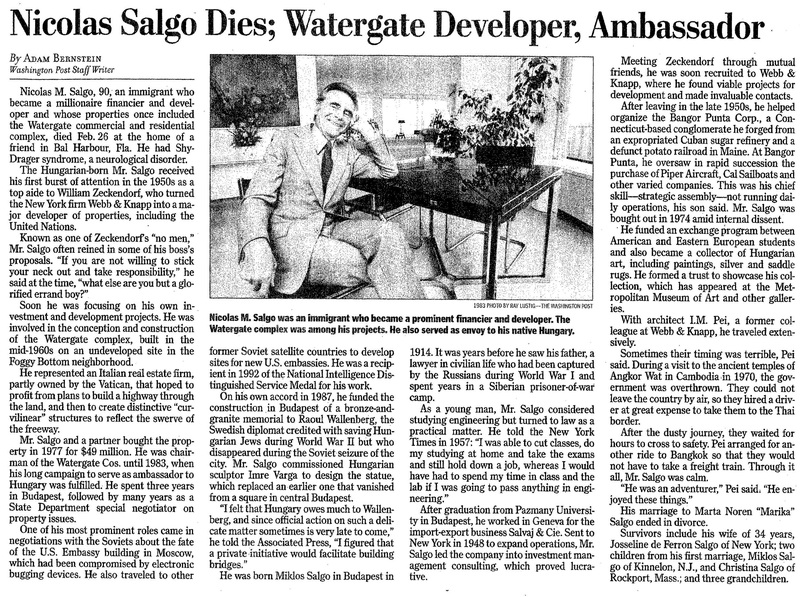 In 1981-82 Ambassador Salgo was a consultant for Central and Eastern Europe to the United States Information Service and in 1983 he was named to the Private Enterprise Task Force formed by President Ronald Reagan to advise him on foreign assistance programs. Nicolas M. Salgo was appointed U.S. Ambassador to Hungary by President Reagan in 1983, serving in that capacity until 1986. After his return to the United States, he continued his diplomatic service, being assigned to the Department of State as Ambassador for special bilateral property projects involving Eastern European nations. In 1989 President George Bush (Sr.) nominated him Special Negotiator for Property Issues, with the permanent rank of Ambassador, with Senate confirmation. 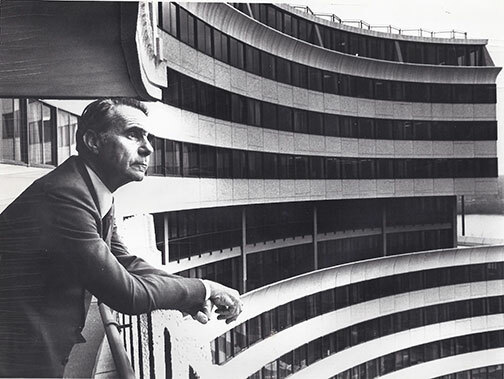 In this capacity, Ambassador Salgo successfully negotiated property agreements with Bulgaria, East Germany, Israel, China and the USSR, as well as with all fourteen newly independent successor states to the USSR. He concluded many years of negotiations with Russia concerning the American Embassy in Moscow and facilitated the opening of new U.S. consulates. 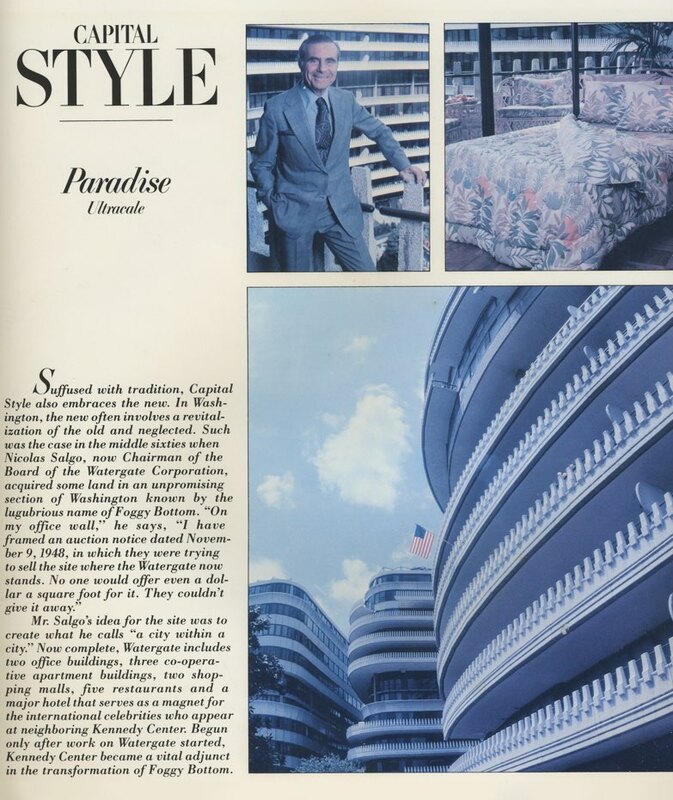 In addition to his accomplishments as a businessman and a statesman, Ambassador Salgo was an avid art collector for over five decades, collecting in a wide range of areas. His famous collection of Hungarian silver has been published and documented as the finest existing historical record of silver-smithing in Hungary from the 16th century to the 19th century. Most of this extraordinary collection is now at the Metropolitan Museum of Art in New York. His vast and beautiful collection of saddle rugs and horse covers has been donated to the Museum of Anthropology at Wake Forest University and the Museum fur Völkerkunde in Leipzig, Germany. Nicolas Salgo began collecting Hungarian art while he was American Ambassador to Hungary during the mid 1980s. He branched out into old Hungarian silver, old Hungarian maps, old Hungarian coins, and Hungarian folk art. After he left his post as Ambassador to Budapest he received special ministerial permission to export the most important works, which had “védett,” that is “protected” status and would therefore normally not be exportable. 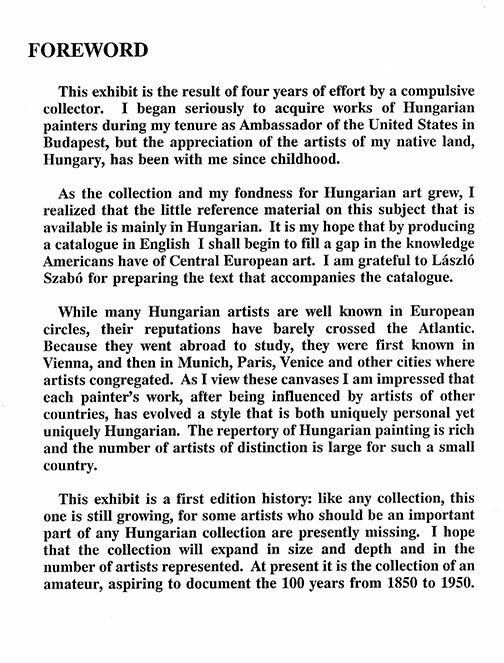 This permission was given with the understanding of the then Minister of Culture Dr. Béla Köpeczi that the works would be employed to make Hungarian art better known abroad. Ambassador Salgo’s efforts and legacy have more than fulfilled this objective since that time. The large and fine collection of modern Hungarian art is internationally renowned and has been the source of many loans to exhibitions. 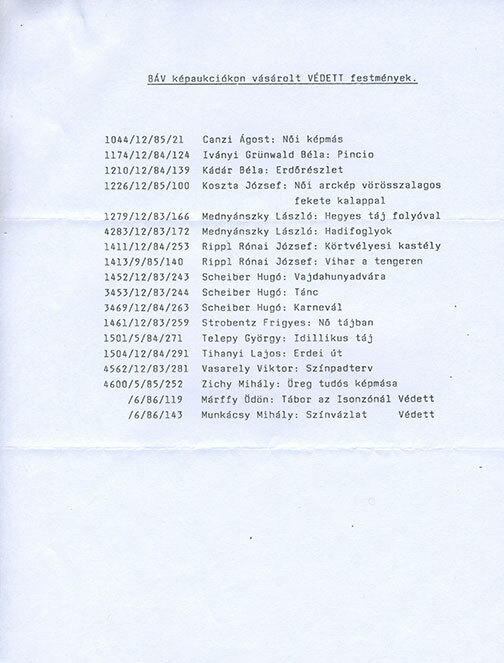 Letter from Minister of Culture Béla Köpeczi of 15 September 1986 to Nicolas M. Salgo announcing the removal of “protected” status of the most important works in Ambassador Salgo’s collection in order that he might be able to ship the works to the United States, with attached list of works.